Parents of elementary and junior high school students will embrace this book as a wonderful insight into what good education is all about. It paints vivid portraits of a variety of interesting and unforgettable teachers who taught in East Harlem. Reflections on 30 Years of Teaching in East Harlem has something for every reader. It’s enjoyable, informative, and will prove to be a great learning experience. Entertaining as well as pedagogic. It is filled with information which can be extremely helpful to prospective and beginning teachers. Experienced teachers may view it as an opportunity for growth. Parents of elementary and junior high school students will embrace this book as a wonderful insight into what good education is all about. Of particular interest is chapter seven, “The 1968 Teachers’ Strike”, which tells about a small group of courageous non-striking teachers who were able to keep a school open and functioning on a 24/7 basis for more than five weeks until the strike was over. Another chapter, “Cast of Characters”, paints vivid portraits of a variety of interesting and unforgettable teachers who taught at this East Harlem school. 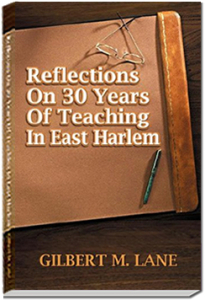 Reflections On 30 Years Of Teaching In East Harlem has something for every reader. It’s enjoyable, informative, and will prove to be a great learning experience. Thank you for sending me a copy of your book. I admire your thirty years of service to students in East Harlem and enjoyed reading about your experiences. Thank you very much for contacting my office and sending me your book. Reflections on 30 Years of Teaching in East Harlem is a valuable resource for teachers and youth advocates in the community. Your book offers a guide for those who are working with the young people of our community. Not only is it a guidebook for teachers it is also an inspiring piece of writing that I am sure will motivate many people to perhaps become teachers themselves.